German-style Bock aged in a Pappy van Winkle bourbon barrel. Looks like a barley wine, smells like a barleywine...if it let looks like a duck, walks like duck...it must be a..dopplebock?? BBA?? NICE. Malty delish. Thanks to Noyoudidnt on this one!! No head and just a slight bourbon aroma are the initial characteristics. The alcohol flavor is subtle at first but increasingly present. Overall, this is one of my favorite Sun King offerings. Whoa, that is some smooth and tasty barrel character. Rich vanilla and toasty, grainy oak, backed by the mild, dark fruits and caramel of the doppelbock. This brew comes out on the more drinkable end of the barrel-aged spectrum, which is certainly welcome. 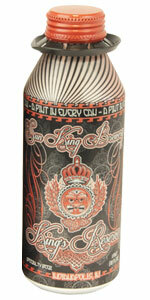 This is a win for sun King and those that get to drink it. Dark color. A little ruby in the light. Very small head, goes away fast. Smells great. Bourbon, vanilla caramel. Same on the taste, with a bit more accent on the dark malt of the dopplebock. Mouthfeel, a bit too carbonated. Overall, I really do prefer a dopplebock like this in the bourbon barrels to many of the stouts that have been put there. I'm glad I still have a few left. I hope they keep well. Served in a snifter at The Tap in Indy. Flavor here is great but for a BBA doppelbock that you envision warming you on a winter night as you slowly sip it, this can disappoint.